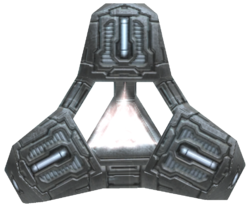 Energy cores are Forerunner devices. They are shaped like a three-sided pyramid that project streams of energy, which meet in a hollow center. The three streams combine to form a pink ball of energy that is maintained in stasis. Similar to the smaller and more common power cores, energy cores are highly explosive if damaged or rammed violently, and will explode with greater power than most conventional explosive devices such as fragmentation grenades. Despite their volatile nature, energy cores are relatively light and can be pushed easily. If they are hit, they will become unstable and turn red, but will eventually stabilize and turn blue again. They are found in Forerunner installations, such as the Halo Array. A number of energy cores were scattered on the frozen landscape of the Quarantine Zone surrounding the Library of Installation 05. The purpose of these devices is unknown, although they could be a battery-type energy source or act as mines laid on Installation 05's Quarantine Zone to slow down a possible Flood outbreak. Two energy cores on multiplayer level Containment. An explosion produced by an energy core.